I’m going to give a much-more-detailed-than-you-want account below, but in case you’re in a hurry, take my word for it: This product is fantastic. Also, Melissa & Doug’s customer service is incredible. I hesitated to buy these for my kids, because I’m cheap and they’re one-time use only. However, I am in love. They are absolutely worth the cost. One of our pens DID dry out before the book was finished. Nevertheless, despite my incompetence, the company mailed me 4 free replacement markers. Read below if you’d care to know the full story. Comments: I remember doing similar “invisible ink” books when I was young and loving them, but come-on, $5 on a book that’s going to be trash when your child is through? I wasn’t wasting my money on that. We really like the Water Wow and reusable sticker books by Melissa and Doug, which theoretically, if you took care of them, would last forever. However, my kids are not the best at taking care of things and I’m not the best at enforcing such behavior. Three months ago, my 4 kids and I decided to road trip with my husband to a conference for his work. I started packing our entertainment travel bag for the 6 hour car ride and week long trip and realized that a lot of my fallbacks needed to be replaced. Our reusable stickers were a giant mess and had greatly lost their ability to stick. One of my lovely children had scratched the disappearing white layer off of a bunch of pages of our Water Wow books. I knew that to ensure a successful vacation, I was going to have to make a small investment to stock up our “fun” bag. 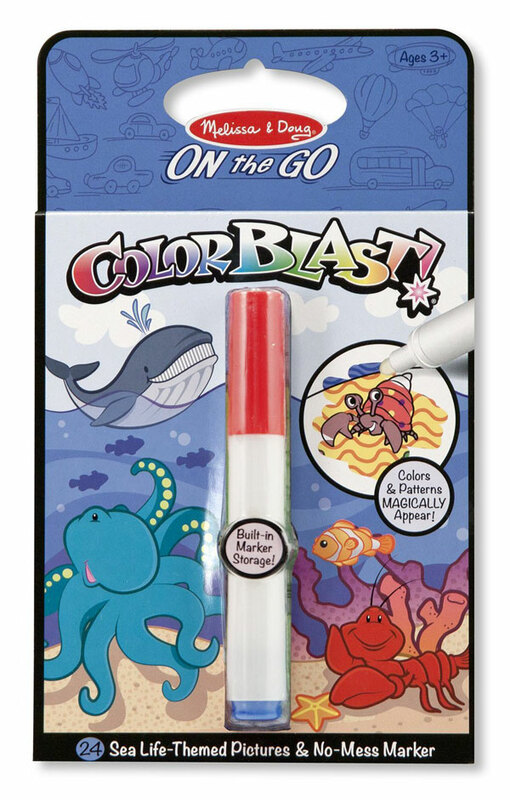 Just to try something new, which is super effective at gaining my children’s enthusiasm, I decided to give these Colorblast books a shot. I bought one for each of my 3 older children (2, 4, and 7 years). The very first night, when my kids were starting to bounce off the walls of the hotel room, I brought out these books. I could not believe the silence that followed. Each child diligently colored 2 pages of their books for about 20 minutes before bedtime. They would have colored more, but I cut them off at 2 pages to make sure they didn’t run out of fun. When the books continued to distract them the following nights and during dinner at a restaurant, I was completely sold. I didn’t know why I was so worried about my kids racing through them. They really do last a LONG time. My oldest colored in his much of the drive home and didn’t complete the book. I was so sure I wanted to add them to my list of recommended travel toys. However, after we got home, my son showed me that his marker was all but dried out even though he still had 5 pages to color. I decided to send an email to Melissa & Doug’s customer service just to see what would happen. Pleased with their response, I decided to try their “trick”. (I realized later this trick is actually printed on the back of the book.) However, I didn’t have rubbing alcohol and was in a hurry, so I tried nail polish remover. Also, being the mom of 4 and a scatterbrain, after submerging our marker, I proceeded to forget about it for the next 3 hours. When I finally took it out, it didn’t work at all. I thought about calling and saying that their trick didn’t work, but ultimately, I just forgot about it. Fast forward nearly 3 months later, I’m cleaning out our house and stumble across the Colorblast book and useless marker. Figuring it couldn’t hurt, I decided to give them a call and see what happened. I told the lady on the phone the complete truth. That I purchased the book a LONG time ago and completely screwed up the advice given. Other than the code on the back of the book which told her which book I had, she didn’t ask for any more verification that I’d even purchased the book. She said she would send me a replacement marker. 7 days later, I received an envelope with FOUR replacement markers in it. I honestly can’t believe how great their customer service is. Maybe I’ve just spent too much time on the phone with our internet company, but I just don’t expect customer service people to be that friendly or helpful. The people I spoke with via email and phone at Melissa & Doug were both friendly and helpful to an astonishing degree. I will definitely be buying more of their products in the future.